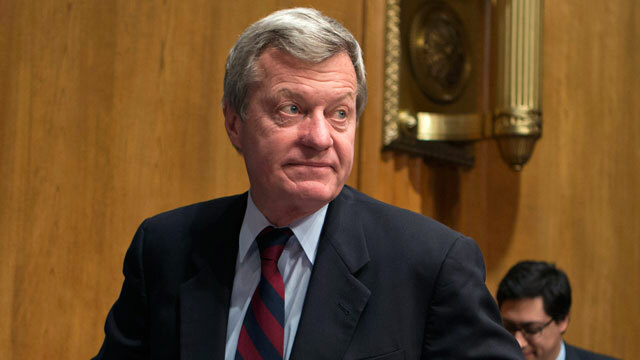 Senator Max Baucus, a Montana Democrat and chairman of the Finance Committee, has decided to not seek re-election in 2014, ABC News has learned, becoming the eighth senator to step down next year. Baucus, who has served in the Senate for 36 years, intends to make his announcement this afternoon. The decision surprised - and angered - some Democrats, given his vote last week against expanding background checks in the gun debate - a top priority of President Obama. The retirement of Baucus gives Republicans another opportunity in its quest to win control of the Senate. But the race could still be intensely competitive for Democrats, particularly if former Gov. Brian Schweitzer, one of the state's most popular figures, runs for the Senate seat. Democrats are now defending open seats in Iowa, Michigan, Montana, New Jersey, South Dakota and West Virginia. Republicans need to pick up six seats to win a majority in the Senate. A friend of Baucus told ABC News today that he has been thinking about retiring "for a long time." He has recently been remarried and "is finally happy," the friend said. "At 72, he can still have a life," the friend said. "It's harder to do that at 79." But Baucus was clearly keeping his options open. He has about $5 million in his campaign account and has been aggressively raising money and meeting with donors this year. A week ago, he said the implementation of the nation?s new health care law had been a ?train wreck.? That was among the conservative remarks and votes that had agitated many liberal Democrats. Baucus has also been losing fights within his party. The latest example is Internet sales tax legislation being considered this week in the Senate - over the fierce objections of Baucus, the chairman of the Finance Committee. He disappointed many Democrats during the Obamacare debate when as a top negotiator he determined a public health insurance option should not be included in the bill. And he helped former President George W. Bush enact Medicare Part D, the prescription drug benefit, as well as sweeping tax cuts. But while Baucus may have not been as liberal as some in his party, he did get results. Obamacare eventually passed. The prescription drug benefit is an integral part of Medicare, and President Obama has protected the Bush era tax cuts for the majority of wage earners. The face of the Senate is changing rapidly, with Baucus joining Democratic Senators Tom Harkin of Iowa, Jay Rockefeller of West Virginia, Carl Levin of Michigan, Frank Lautenberg of New Jersey and Tim Johnson of South Dakota in retirement. Republican Senators Mike Johanns of Nebraska and Saxby Chambliss of Georgia also have announced their intention not to seek re-election.